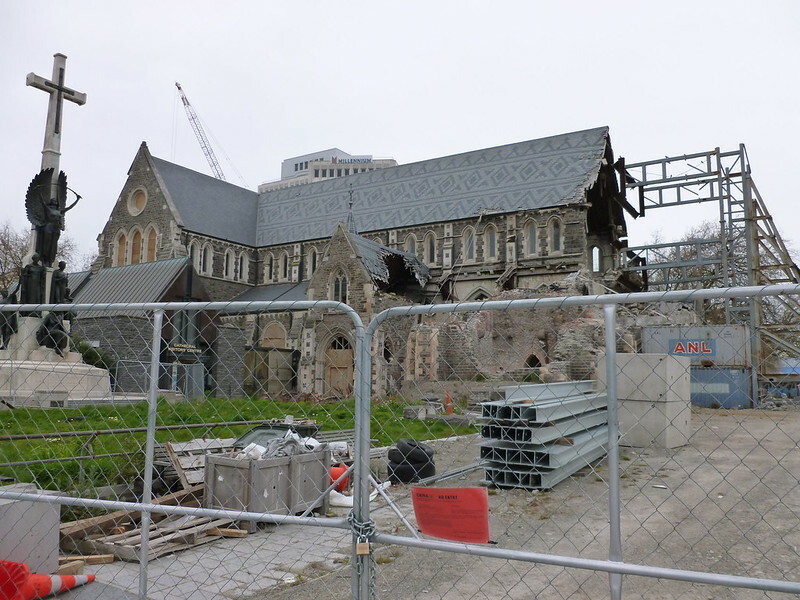 This won’t come as a surprise to anyone, but I’ll still say how glad I was to move on from Christchurch. 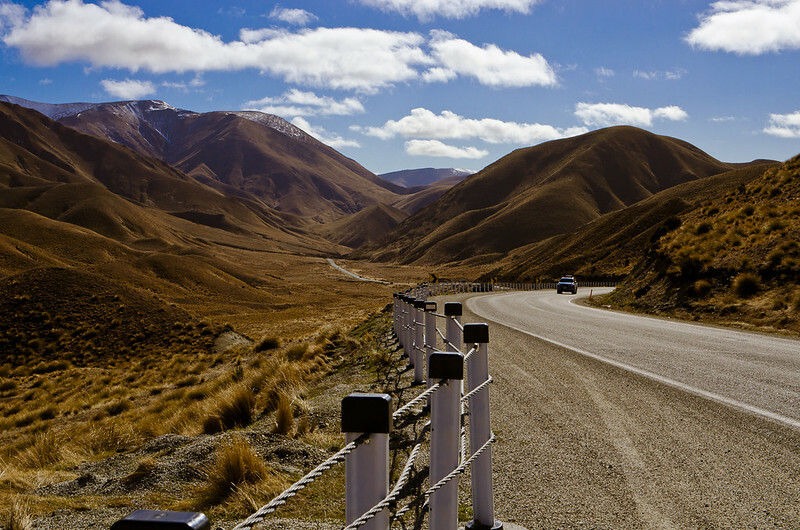 The drive to Queenstown was, yet again, beautiful. 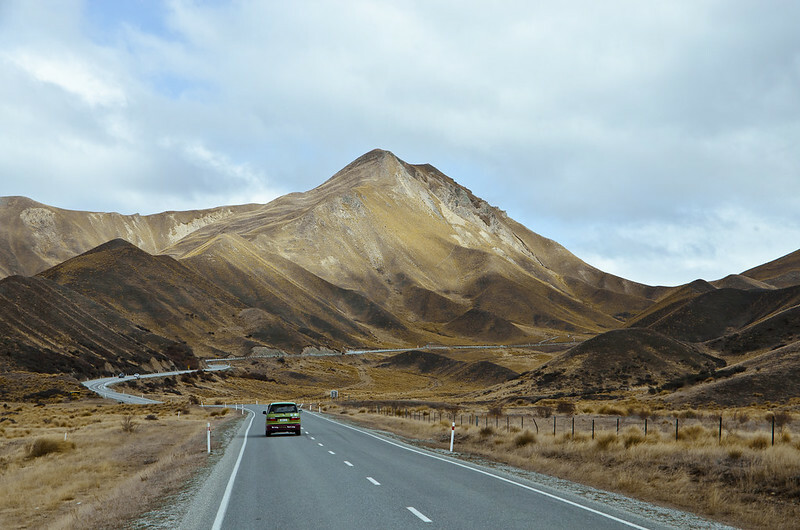 More mountains, more empty roads. More photos, naturally. We arrived in Queenstown some time in the afternoon, still early enough to take the cable car up the hill overlooking the city. Certain people had issues with the height, but I got to take some pretty cool pictures, so yes, definitely worth it! We watched most of the sunset from up there, and then made our way back down again. Dinner was a quick affair in one of the food courts that we learned to love over there, and that was it for the day. 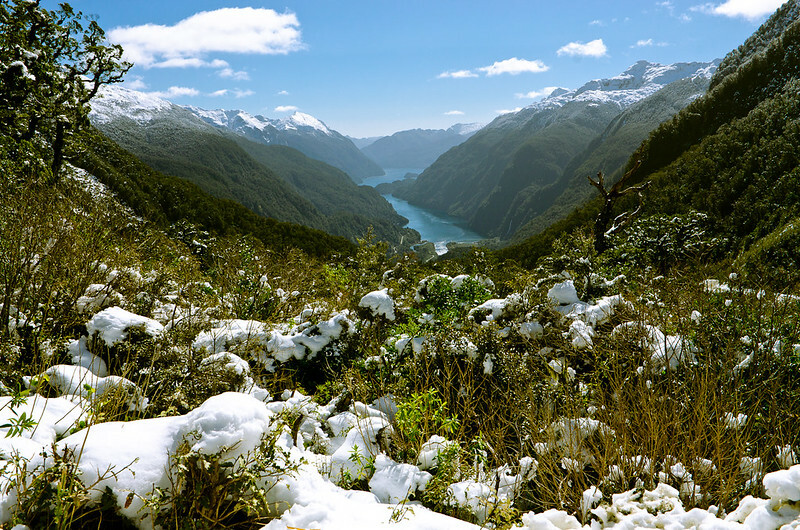 The day we were supposed to go to Milford Sound. I say “supposed to” because we got up incredibly early in the morning and trudged through the cold to the bus stop, only to find out the road to Milford was closed due to snow. To say we were disappointed would be the understatement of the, if not century, at the very least decade. 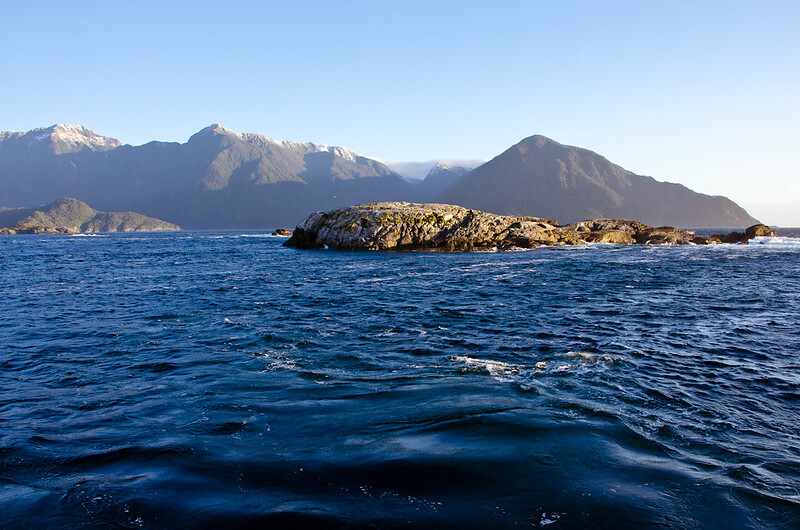 We also didn’t have the time to postpone the day trip because we already had a different fjord booked for the next day. 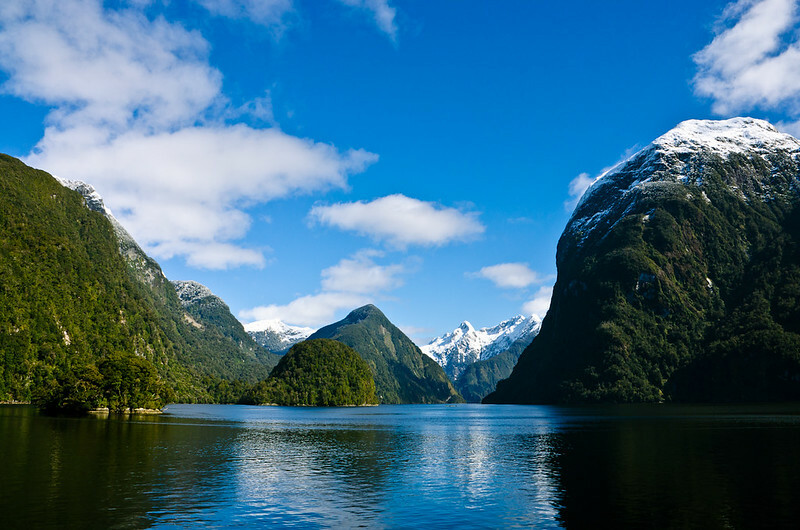 So yes, we’ve been to New Zealand, but we’ve never seen Milford Sound… Guess we’ll just have to go back. 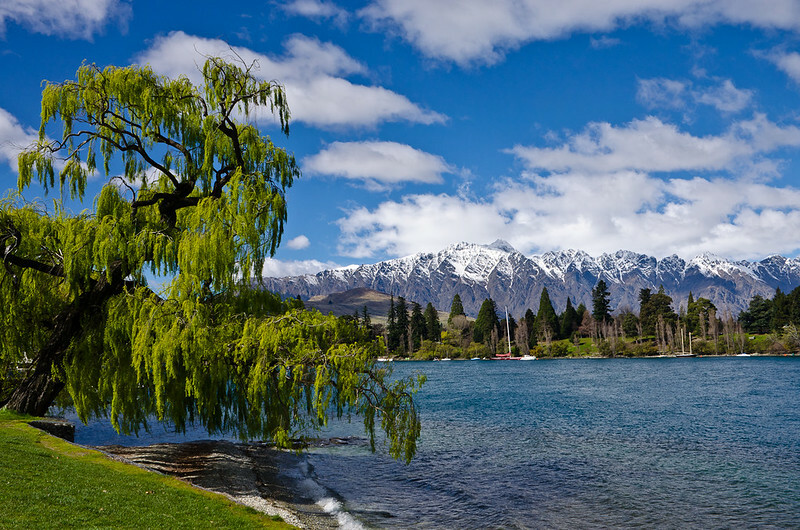 Instead of sulking, we spent a lovely day in Queenstown, though. 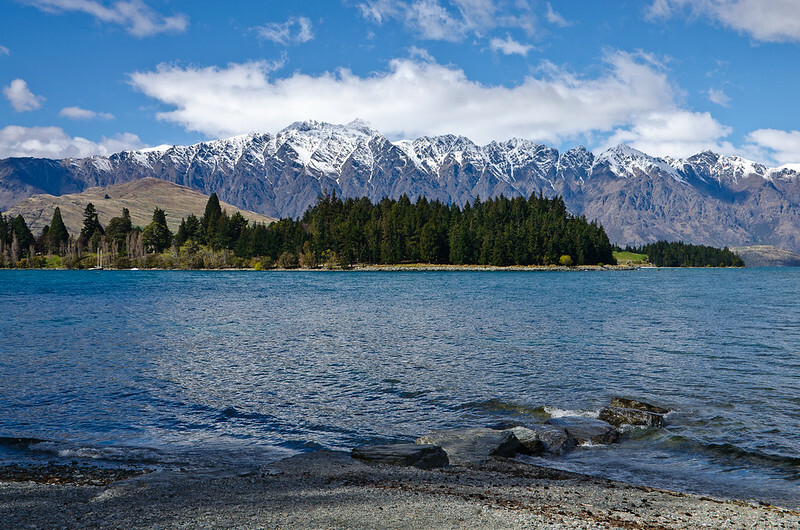 Despite the cold, there wasn’t actually any snow in Queenstown, and the sun was out. We stood at the waterfront for a while, just looking at the lake and soaking up the atmosphere. At some point, we went to the Kiwi Birdlife Park to see some kiwis (obviously!) and some tuataras (which I loved—living dinosaurs!). I wish I could show you some pictures, but since most people are too stupid to turn off their flash, no cameras are allowed in the kiwi house. That was definitely one of the highlights of the trip, though! All in all, a surprisingly good day. Another early morning, but oh so worth it. 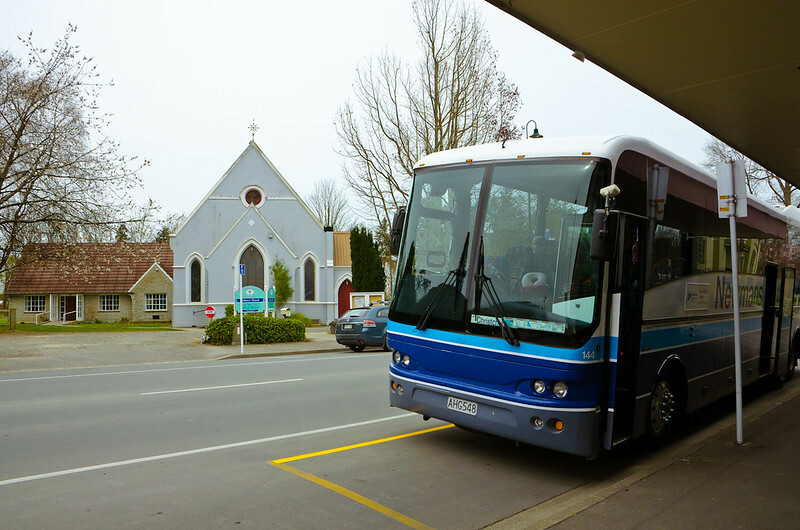 We hopped on a GreatSights coach (ironically the one that was on its way to Milford Sound because the road was open again…) and got off in Te Anau to be picked up by the company we’d booked our overnight cruise with. 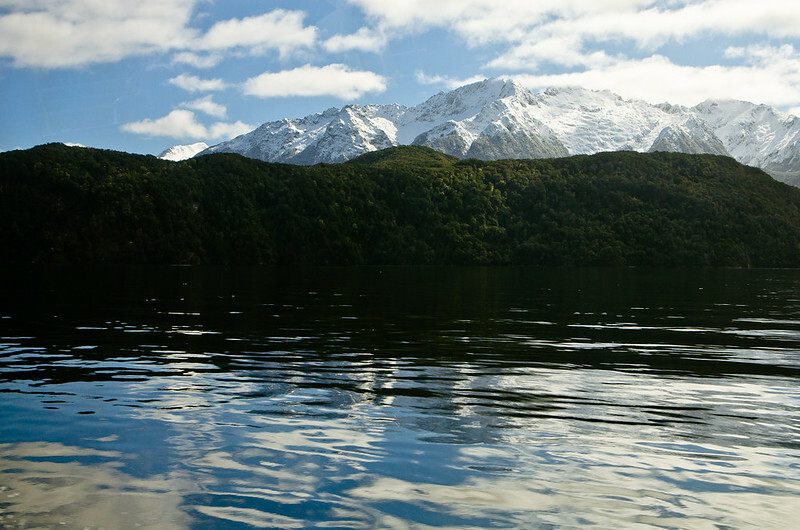 Once we got to Lake Manapouri, we were put on a boat, and that boat ride alone was wonderful. Once we’d crossed the lake, another coach was waiting for us. 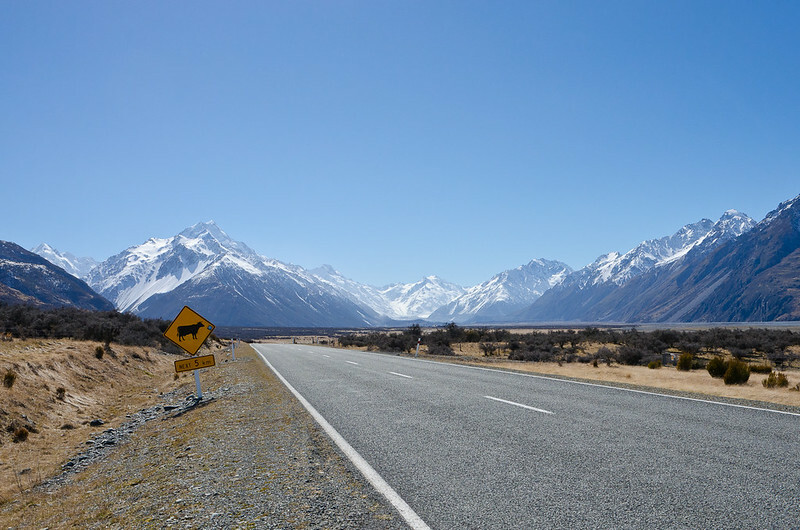 What followed was a drive on the only road in the country that isn’t connected to any other road, built specifically for the construction of the Manapouri Power Station. Edit: As per Olli’s request, I have to include that it was ‘the most awesome’ vista, because apparently, he’s not satisfied with ‘we enjoyed our first look’. 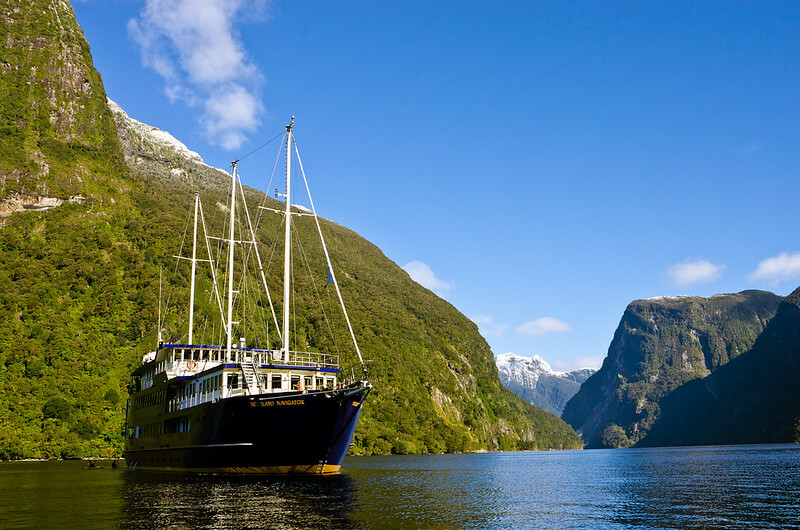 After that, we soon reached Doubtful Sound itself, were loaded onto a ship, and sailed off in short order. 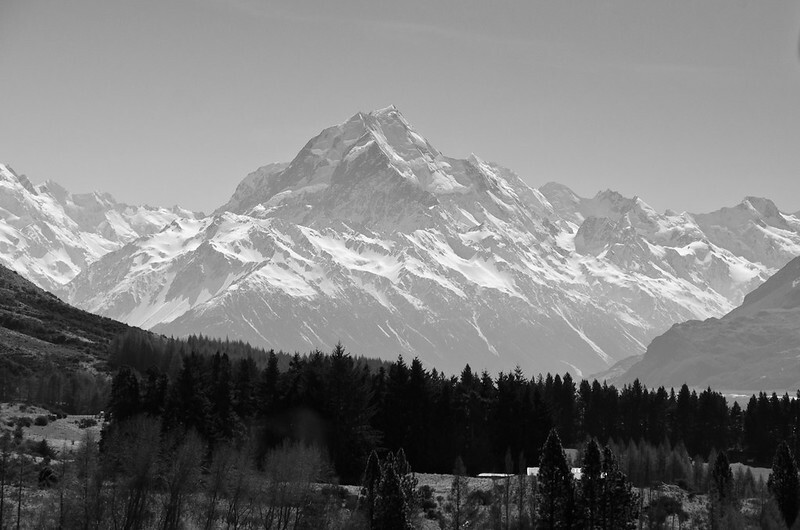 The landscape was nothing short of breathtaking, and the weather, as we later learned, was unusually sunny. 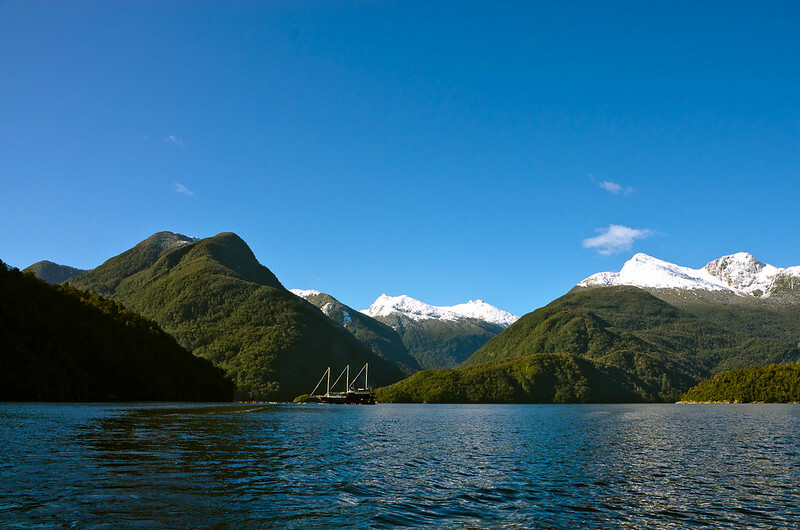 We then had the choice between going out on a smaller boat with a guide who would tell us about Doubtful Sound, and kayaking the fjord. I love kayaking, so I really wanted to do that, but in the end, we picked the alternative. It turned out to be a good choice, too, because the paddlers didn’t really see much at all, what with most of them never having kayaked before and needing practically the entire time just to get used to paddling. At some point, we were pretty far away from the ship, and look how tiny it really is in comparison! 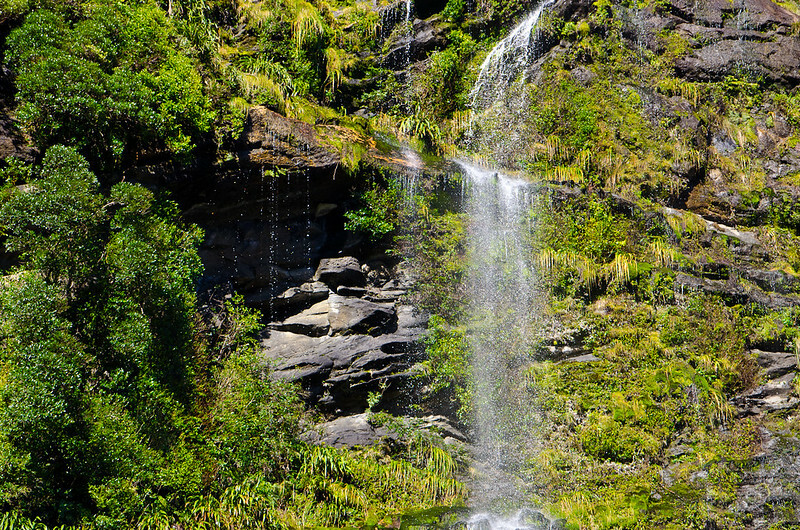 All through the guided ‘tour’, as it were, as well as through the entire day, we saw waterfalls everywhere, from tiny to fairly large. I’m not embedding pictures of all of them here—I haven’t even uploaded pictures of all of them, there were just too many; you can look at a selection on flickr, though, if you’re so inclined. The itinerary for our night out said we’d be going out to sea for a few minutes, just so we’d know what that felt like, and I’m not going to lie, it was pretty rough. I don’t really get seasick, thankfully, but just walking in a straight line proved a challenge at best, and impossible at worst. It was still a great experience, though. 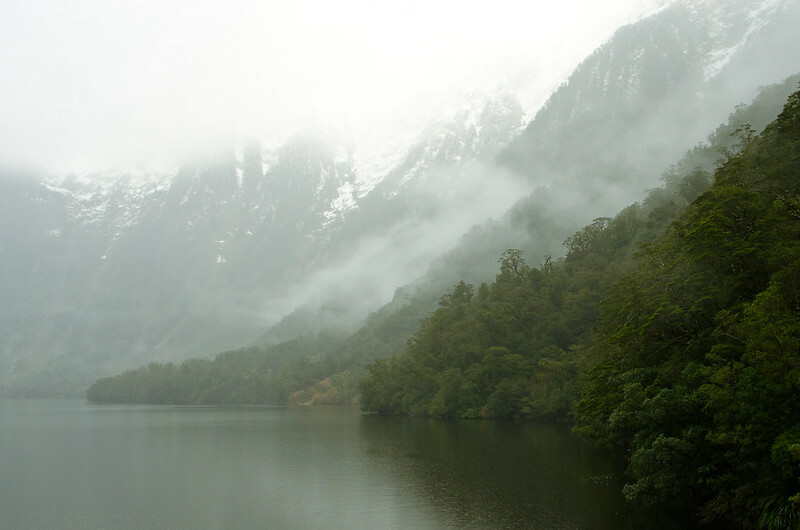 We soon returned to the calm waters of the fjord, dropped the anchor in a particularly peaceful bay, and spent what was left of the evening and the night there. On the ship, they had a huge buffet dinner, with lots of different salads for me and lots of different meats for Olli—theoretically, anyway, because he was feeling sick, so he couldn’t even enjoy any of it. After dinner, we headed outside to the deck to look at the stars, but it was so cold we couldn’t take it for more than a few minutes. Instead, we soon went to bed, such as it was, in our shared four-bunk cabin, and slept surprisingly well. 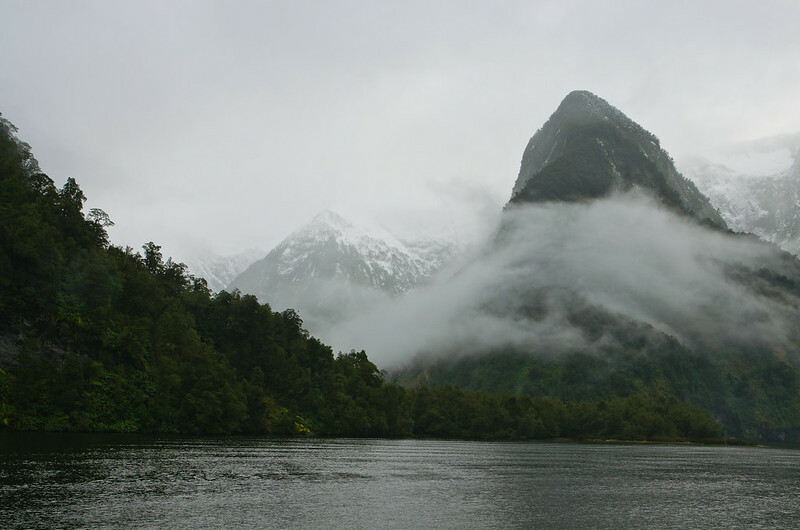 The next morning, we woke to heavy rain and grey skies—in short: what the weather usually looks like in Doubtful Sound. 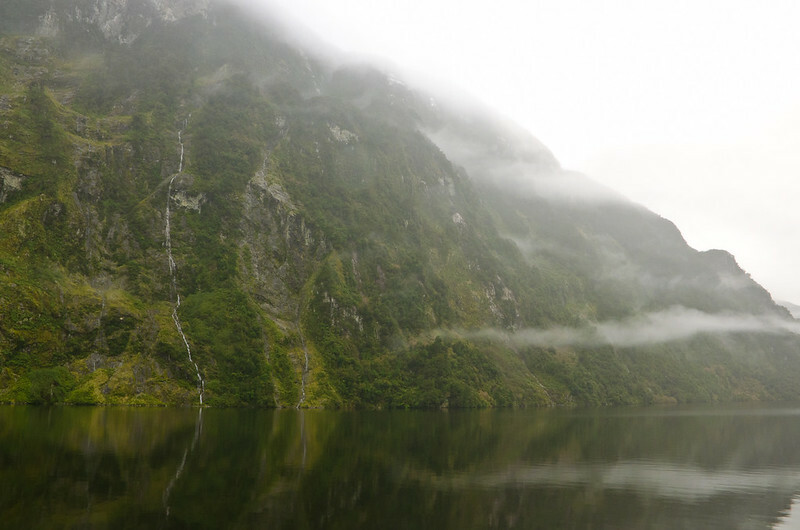 I can’t say I was disappointed, though, because it made the entire landscape look so different, and we’d already been lucky the day before, so seeing the fjord the way it looks most of the time was actually great. Breakfast was again a large buffet, though mostly stuff such as baked beans and hash browns. Nothing I’m interested in. Olli, however, was feeling better and got to dig in. We even saw our first dolphins! They were a bit shier than the ones we’d see a few days later, but it was still wonderful. 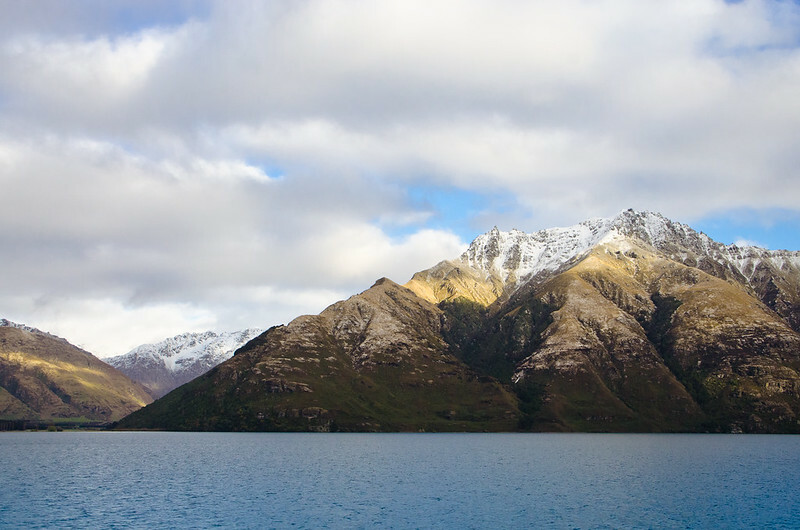 Since we were nearing the end of this tour, the ship slowly made its way back to the dock, where we were loaded on coaches again, then back onto the Lake Manapouri ferry, and back onto another coach that dropped us off in Te Anau. 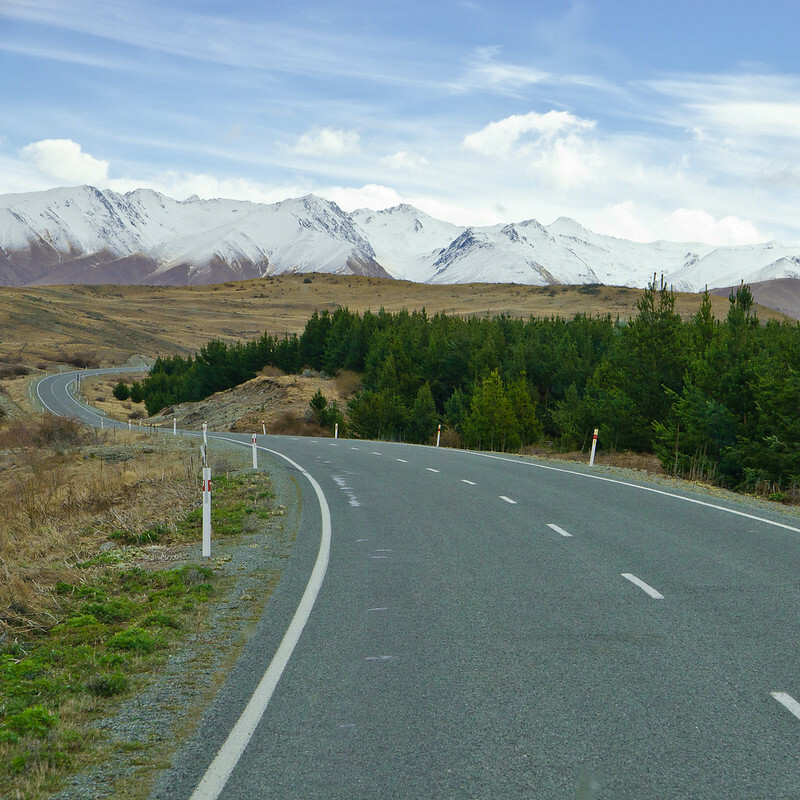 From there, we were picked up and brought straight back to Queenstown for another night. For dinner, we headed towards the super crowded Fergburger, and about half an hour later, we knew exactly why it was so crowded. They make amazing burgers. Olli had a regular whatever-they-put-on-burgers burger, but I went for a vegan Thai burger thing and dear god. If Fergburger decided to expand to, say, Berlin, I would not be opposed at all. Queenstown didn’t get to keep us long, though. 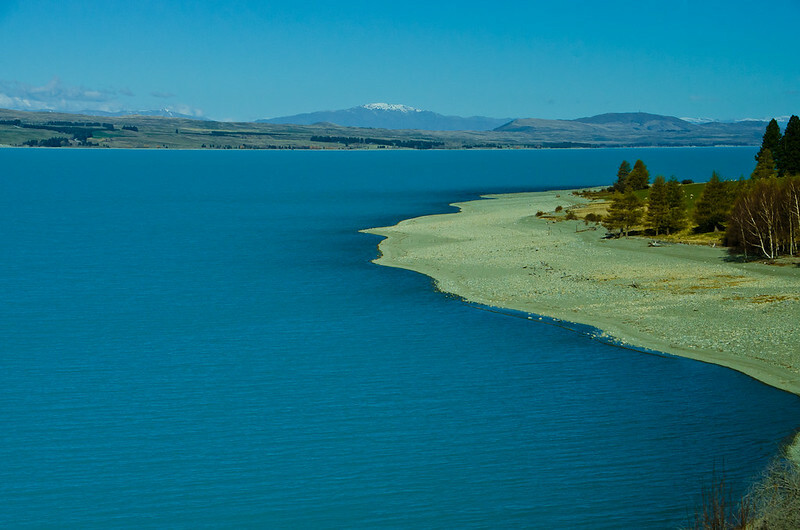 We were off again the next morning, towards Lake Tekapo. It was a beautiful day, and because we apparently hadn’t spent enough times on coaches yet, we had decided to take a detour via Mt. Cook. Spoiler alert: It was totally worth it. 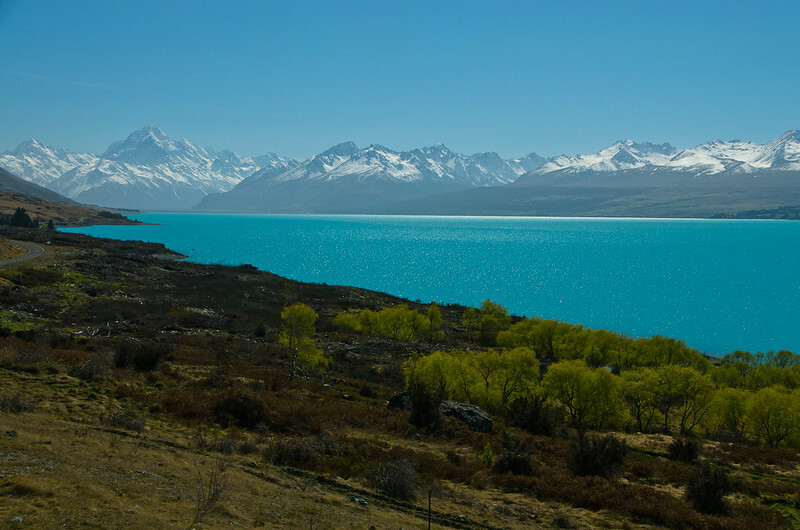 Next up was Lake Pukaki, the most turquoise of lakes. 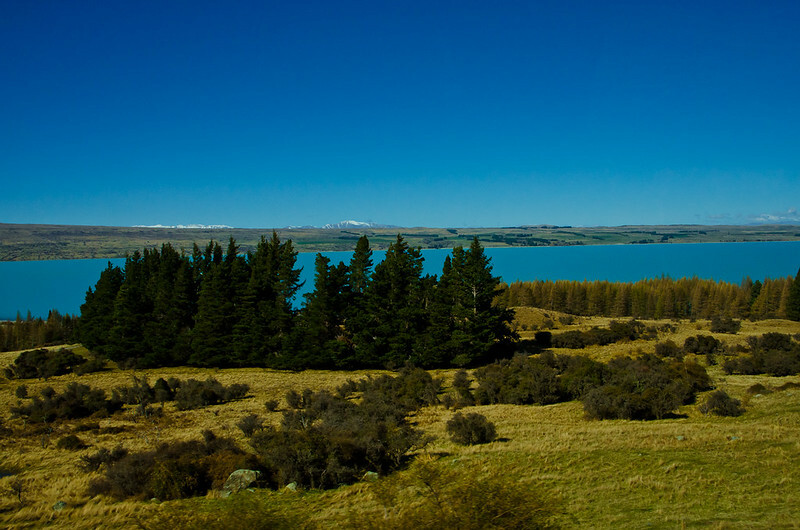 With a last look at Lake Pukaki, we were off again, properly on our way to Tekapo this time. 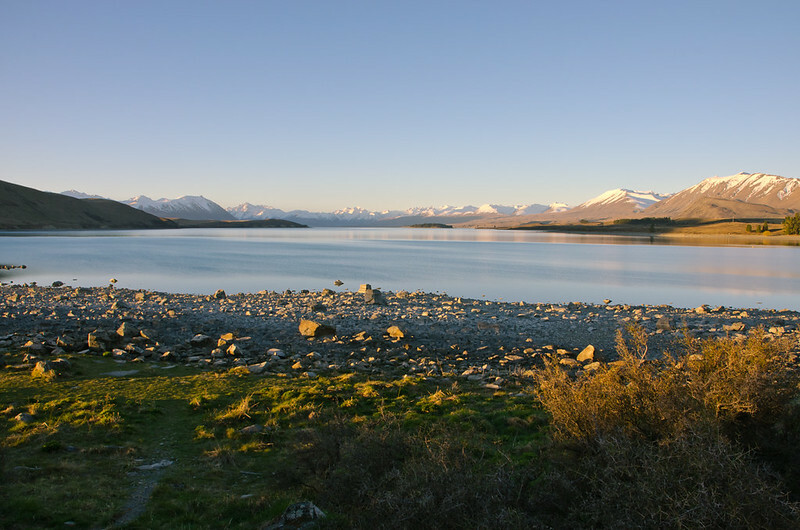 Once we’d gotten to Tekapo, we more or less immediately went to the Earth & Sky office and booked their tour for the night. Ridiculously expensive, but so worth it. If I had to pick just one highlight of the entire trip, this would be the one for me. We walked around town a bit more, got some dinner, and then went back to the Earth & Sky office once it was dark. There, we were outfitted with heavy winter coats, and we’d thankfully thought to buy gloves. Because it was going to be cold. Really, really cold. The way up onto the hill was an adventure all on its own. At some point, the driver turned off all the nights so as to not mess up the observatory’s equipment. And I do mean all of them. Headlights? Gone. Any and all lights inside the vehicle? Switched off. It was really. freaking. dark. And we honestly had no idea how he was even still driving without being able to see the road. But we survived, and that’s all that counts, really. 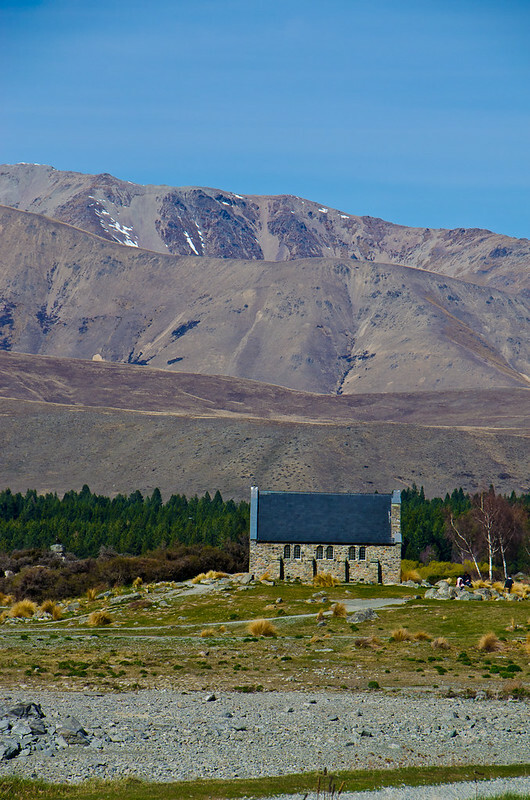 Tekapo has very little light pollution (probably not least of all because everyone who drives up the hill at night turns off their headlights…), which is why Mt. John University Observatory is the perfect place to stargaze. 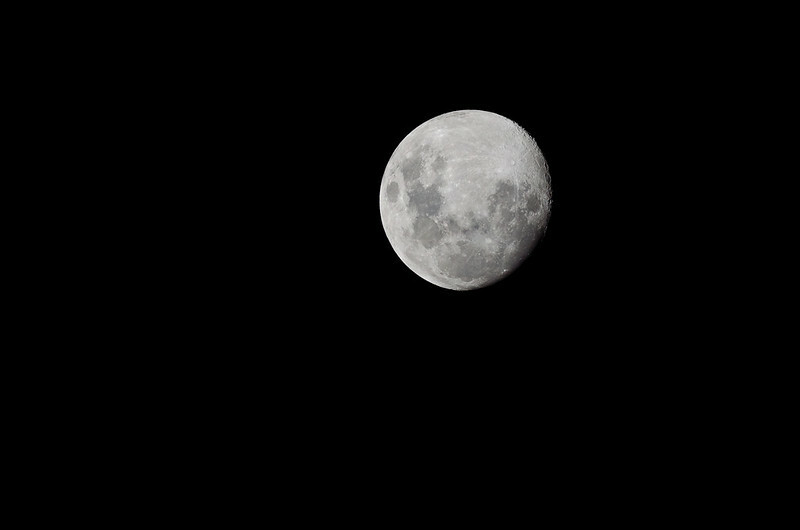 Sadly, with it being the wrong time of the month, the full moon was out while we were there. We still learned a lot about the stars, got to look at a cluster of stars through a telescope, and even got to take a picture of the moon through a telescope. I need to get myself one of those. Well, not one of those; a smaller one, maybe. The guy who led our little group, Chris, asked all sorts of questions to gauge our knowledge (e.g. “What’s the nearest star system?”, “What’s the most famous constellation in the southern sky?”). And not to brag or anything, but I knew all the answers. 462893 points to Ravenclaw. Honestly, it was the greatest experience. It seems we didn’t do anything that day. I have only two or so photos, but it was about time we took a little break anyway. 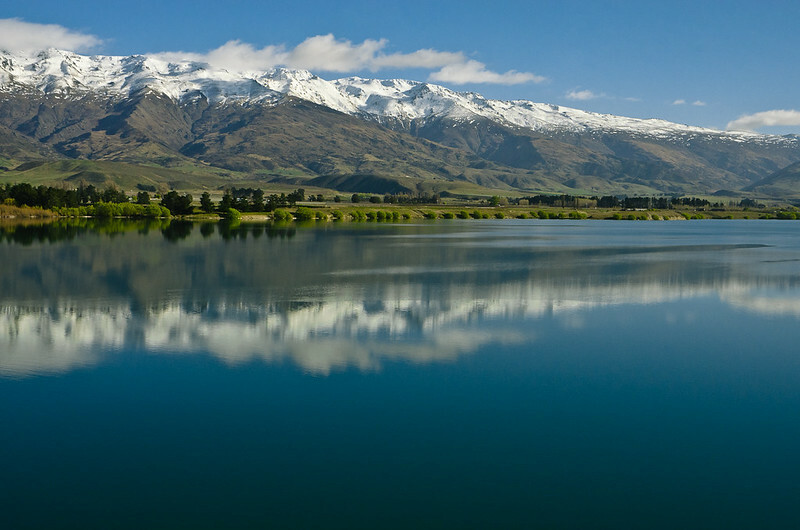 Lake Tekapo is very pretty, though, so it’s not as though it was a burden not to move on immediately or anything. This time, we did not stay in a YHA. For some reason that we were never able to figure out, the YHA Tekapo was nearly fully booked; the only room we could’ve gotten into was a four-bed share, and after having had to share a room on the ship in Doubtful Sound, we decided to cancel our booking and got a double ensuite at the local BB-Hostel instead. A great choice, to be honest. Not much more to tell here. And yet again, the post is going to end on a low(ish) note… I’m sorry. Why do I not have more pictures, you ask? 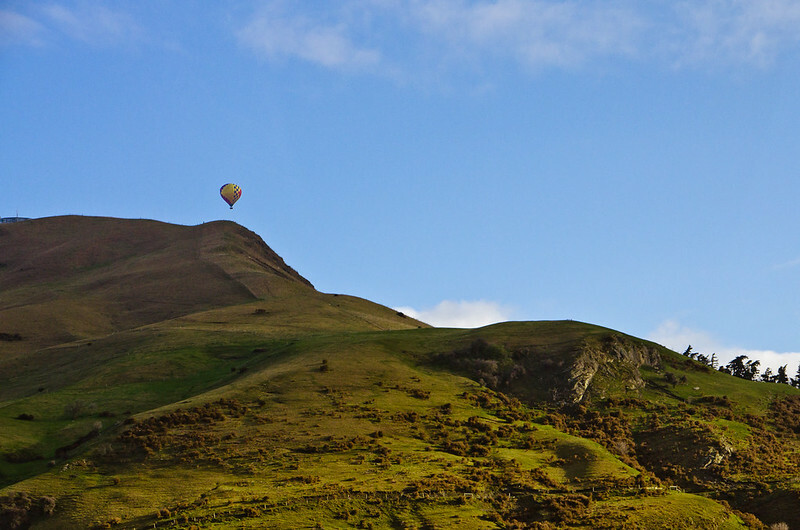 Because at the end of the day, we were back in Christchurch. We did make it to the YHA this time around, but the room we ended up in wasn’t much better than the motel from the week before for being covered in mould. Ever since my former landlord decided to dig up half of the cellar in the building I used to live in, I’ve had a severe mould allergy, so you can imagine what my night was like. Olli went out for a bit to take some pictures of the city, but it was honestly too depressing for me, so I stayed in, grateful that we would be moving on again the next day. And that’s the third week! We’re more than halfway through the report, only two more weeks to go. 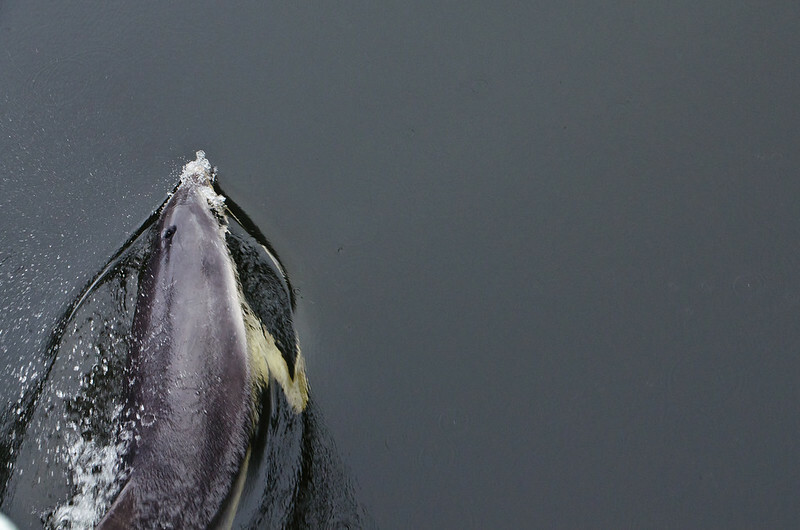 To make up for the less-than stellar ending of this week, let me give you a preview of what’s coming next: Dolphins! The Lord of the Rings! Sulphur! (Okay, that last one might not be a good example.) Hobbiton! Glow-worms! Stay tuned.